On Saturday I told how the family moved house in 1956 in order to live with my mother’s new partner. The house had previously been the home of the village’s Baptist Minister. It was one end of a block that was originally built to accommodate a small school and schoolmaster’s house as well. The school had long since merged with the village school and been converted into a home. For a number of years all three had been rented out to tenants but, when the tenant of the former manse left, the trustees decided to sell all three. The former school and master’s house were sold to the sitting tenants and the former manse to us. The village is named for the Church of St Peter which was established in Saxon times on the banks of a small river. The Normans enlarged the church and allegedly gave the river its name: Dore, from the French d’or, literally ‘of gold’. The river’s valley they called Golden. A couple of miles upstream from the village is a smaller community called Dorstone. Downstream are two hamlets, Vowchurch and Turnastone. Legend has it that two rival land owners both wanted to build a church there. 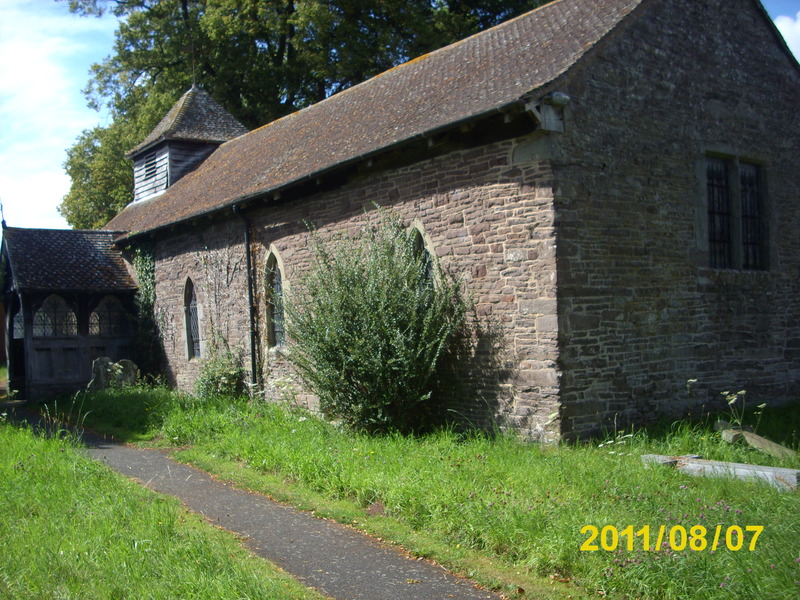 One is alleged to have said “I vow I’ll build a church before you so much as turn a stone.”Alongside is a photograph of Turnastone church. The combined population of these communities would have been, in the 1950s, no more than 1000. My wife and I were married in Turnastone church in 1963. Five years later I obtained a job as a Design Draughtsman working for a large company in their Coventry head quarters. I worked in an office with about 30 other designers and engineers on the top floor of a three story building with similar sized design offices on each of the other two floors. One day I was chatting to a colleague and remarked on the fact that, although his name sounded Welsh, he did not have a Welsh accent. He explained that his father was Welsh but that he’d lived most of his life in England. “We did live in Herefordshire for a while,” he added. I asked him where exactly in Herefordshire and he surprised me by saying that is parents had run the village shop in Dorstone for a number of years in the early 1950s. At the time I thought that quite strange but it was nothing compared to what happened years later in Grimsby. The large company I had joined in Coventry operated manufacturing plants throughout the British Isles and, in 1979, I became a Project Engineer at their plant in Grimsby. We purchased a house in Cleethorpes. I became involved in local politics and, in 1985, was elected to the County Council. Grimsby is some 200 miles from Hereford and yet, here we were, two people who had each lived in the same house in a tiny village, at different times, many years before. Such a coincidence appearing in a work of fiction would have the reader struggling to suspend disbelief. Use the comments to tell of a similar coincidence from your own life or an example of a novel, play or movie whose plot you think relies too heavily on coincidence. By franklparker in General posts on April 4, 2016 . Wow…this is beyond coincidence! Very interesting, a tale of fates! Enjoyed reading this. I enjoy a good coincidence. This was an interesting read. When I was working as a software developer years ago, I mostly worked from home but went to the office every week or two. Once, I was signed up to attend a convention in Toronto that ran for the weekend. Since I lived north of the city, I spent the weekend at my mother-in-law’s, who lived on the outskirts of Toronto at the time. I took the subway downtown, and the first day, I met a nice woman who I attended the workshops and seminars with. At the end of the day, she asked me how I planned to get to the next day’s sessions. I hadn’t realized that the subways don’t run as early in the morning as I’d need them to on weekends. I was stumped. What could I do? She asked where I was staying–perhaps if it was close to where she lived, she could give me a ride. When I told her, she laughed. When she was finally able to explain what was so funny, she told me she lived across the street from my mother-in-law and had seen her outside often. Needless to say, I got to my morning seminar on time the next day. What are the odds that I’d hook up with the one stranger among thousands who lived across the street from my mother-in-law? I think that tops mine! Thanks Val.